It’s spring and everyone seems to have the travel bug! With the value of the dollar stronger than in recent memory, many Americans are taking to travel abroad to get a firsthand taste of our increasingly globalized society. In an attempt to quash our long-standing identity as rude Americans and remove the Housewives blemish we have become so closely associated with, here’s a little refresher course on how to behave when journeying and exploring a foreign territory. Remember, you’re unofficial acting ambassadors of our country. Do us proud! Dress appropriately for international travel. Wear shoes with socks. Long pants or leggings are the most comfortable. Take a sweater or coat for cool cabin temperatures. 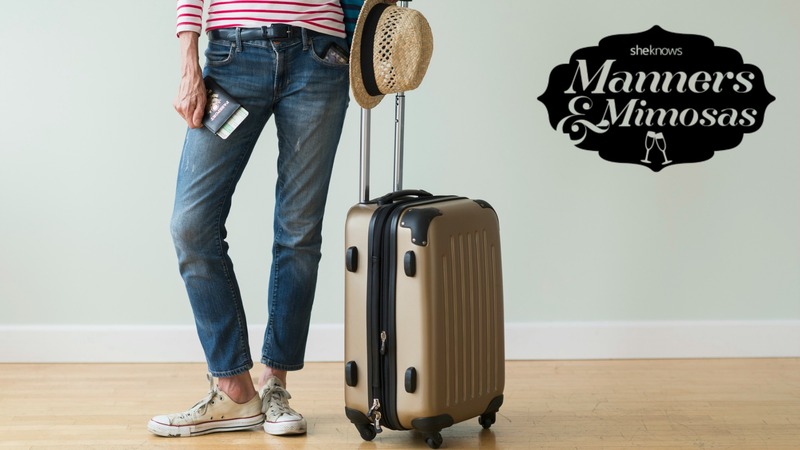 Bring only carry-on cases that will fit in the overhead compartment. Use the restroom beforehand unless you are seated on the aisle. Refrain from boarding with offensive-smelling foods. Keep crunchy snacks to a minimum. Instead, try sampling the airline’s cuisine. It may be serving dishes from the territory you will be visiting. Watch alcohol intake; limit yourself to one glass. It will make jet lag less likely. Drink plenty of water, apply hand cream and lip moisturizer; this will help keep you hydrated. Curb any diva tendencies. If the flight is delayed or grounded, stay calm and go with the flow. Nice hotels may have strict guidelines regarding permissible attire to be worn in the common areas. Consult in advance to be sure you bring appropriate clothing. Manage voice level when dining or socializing. Always speak kindly to the staff when asking questions, making inquiries or reservations. Use the magic words: please, thank you, excuse me, I’m sorry… constantly. Apply the expression “when in Rome,” and do as the others do. If you are greeted with a handshake, extend your hand willingly. A kiss on each cheek is never seen as romantic, merely a warm gesture of friendliness. If you are greeted with a bow, go along as this is seen as a sign of respect in Asian countries. When visiting churches, synagogues or other places of worship, show reverence by dressing conservatively. No shorts or flip flops. Bring a wrap to cover shoulders. If you are asked to remove your shoes, do so. Leave food and drinks outside. Turn cell phones off. Keep voices low. The same deference should be applied to museums containing significant works of art. Respect and mindfulness is the motto to be upheld any time you are in a public space. While many foreigners learn English as a second language, Americans should never assume everyone speaks English. Make attempts to master a few key words and phrases in your destination’s language. There are countless language and translation apps for this very purpose. This will not only leave a good impression, it will enable you to communicate more freely thus making your trip more pleasant. Do not worry about perfecting accents or pronunciation, the effort is what matters most. When in doubt, dine continental style utilizing both fork and knife, fork tines down. Place napkin folded lengthwise neatly in your lap. Employ the resting position (fork and knife in an upside down “V” at the top of the plate) when taking a break and the finished position (fork and knife together on the diagonal to the right) when you have concluded your meal. If dining in a country that forgoes utensils altogether, dive in with your bread, your fingers, your chopsticks or any other device meant for bringing food to your lips. The tipping conundrum of who to tip and how much to give varies from country to country. Review your destination’s tipping habits and expectations, from restaurants and hotels to transportation and tour guides, prior to departure. Many of the workers rely on tourists for gratuities to feed their families and pay the rent, but it is important to educate yourself on the nuances. While it would be considered rude to stiff a service person, handing over a large clump of cash in certain countries may be considered equally offensive.